YUAA’s 2014 Aeronautica was a great success with over seventy-five people in attendance. In addition to premiering a new video, the event featured a keynote address by Stephen Hall (’14) and Jan Kolmas (’14), who have been with the organization since its beginning in 2010. The pair discussed YUAA’s growth from two people in a room with a blackboard to over forty in the CEID, building rockets, planes, and more. 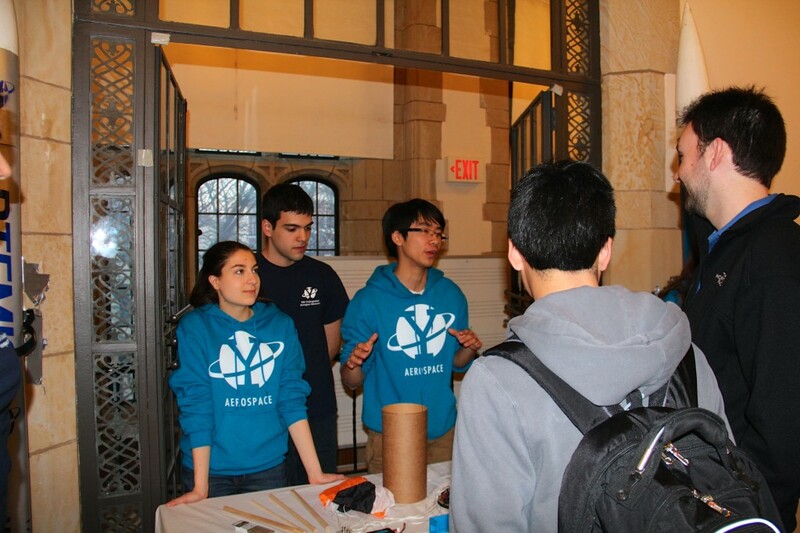 After reporting on the success of the Eli Whitney which competed at the Battle of the Rockets competition last April, they also presented this year’s completed and ongoing projects, the Lighter than Air Competition, the Rocket-Deployed UAV, the Rocket Competition, and the Quadcopter. Stephen and Jan took time to honor those who have helped YUAA over the years. 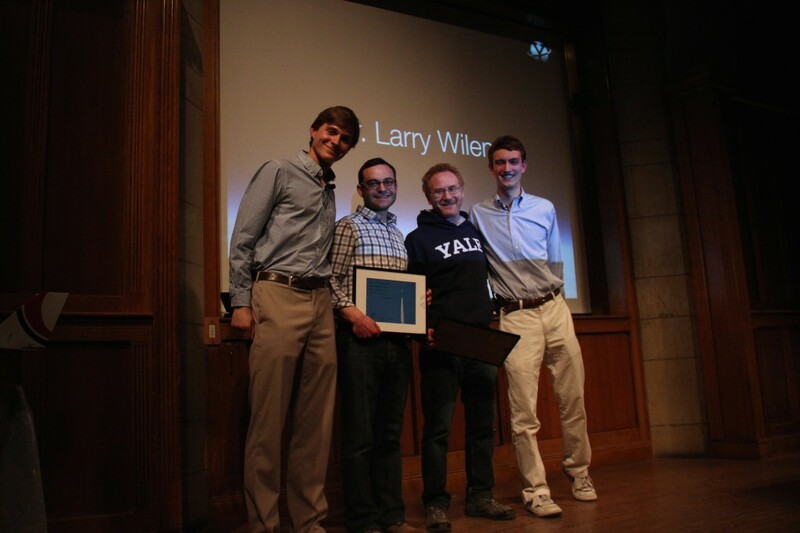 This year, awards were given to Harley Pretty of the Yale SEAS office, CEID Design Mentor, Larry Wilen, CEID Assistant Director, Joe Zinter, and graduate student Joe Belter. After a wonderful talk, the audience gathered around tables where they saw the projects, including a fifteen foot rocket, first hand. 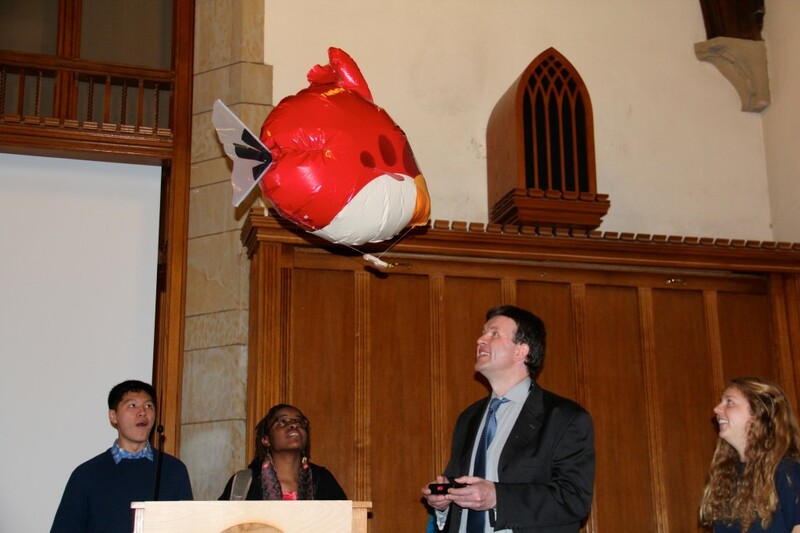 Professors, friends, Professor Udo Schwarz, who many of the YUAA members have taken classes with, even tried his hand at flying YUAA’s blimp!